On the morning of April 2, 2008, my high school soccer team had morning soccer practice after the game the night before. It was our typical practice. We warmed up, stretched, and then we went into some scrimmaging. I went up for a header, and came down funny. I fell to the ground with instant pain in my knee. I was crying in a lot of pain. The pain stopped after a minute, and I got up and walked off the field. I sat out for the rest of practice, and noticed that something was wrong when I felt my knee buckle on me. I immediately told my coach who called the team doctor to set up an appointment. My mom picked me up from school and took me there. They couldn't really tell me anything since only an MRI would show tissue damage. The next day I had an MRI, and it also happened to be senior night for my team. The team doctor had a chance to look at my results before the game, and he informed me at halftime that I had torn my ACL. I never wanted to hear those three letters in a row. It was heartbreaking. Just thinking that I would be out for 6 or more months from the sport I love was unbelievable. me a book called "Mind Gym." She told me to read it during my recovery. She came over after my surgery and hung out with me and told me that I will be back. I kept that mentality throughout my recovery. I wanted to get back on to the field again and have that amazing feeling when I scored a goal. I spent my entire summer rehabbing, and it was totally worth it. Every follow up appointment from the doctor was progressive. When the doctor told me that I could start running, I was ecstatic. Something so basic that I had taken for granted beforehand, I was now able to do. I was at the three month mark, halfway done. I continued my recovery and was cleared to start kicking the ball around 4 months. At 5 months I was cleared to start practicing with my team without contact. Finally at 6 months in October 2008 I was released to play soccer full contact. It was honestly one of the best days of my life. All the hard work that I had done over the past 6 months was all worth it.My scar on my knee makes me proud of everything I had faced in the past 6 months. 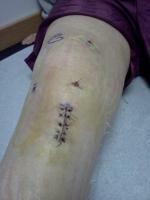 For those who have had or are going to have ACL surgery, STAY POSITIVE. I can't stress that enough. Your attitude is so important throughout this obstacle. It will get better, TRUST ME. The most important thing is to do the exercises at physical therapy, and work hard.